Ten years into our careers, we’ve taken our share of bumps and bruises. We’re still optimistic, but we’ve learned to test the waters before throwing out something crazy to see if people bite. We might email a wacky YouTube video to a few people on our team to test the response. If they tell us it’s fun but completely unrealistic for our industry, we cross it off our secret list of possibilities. We’ve gone from pitching wildly creative ideas every day to floating mildly interesting ideas once every six months. By the time we’ve invested two decades in a stable career, we’ve got a lot to lose. At this stage, we may only pitch a new idea once every two years or so. Even then, it’s often just a rehash of something we’ve done before. Something safe. 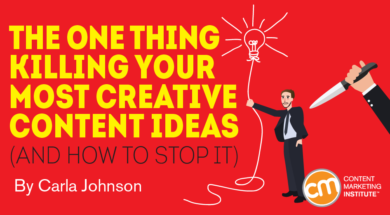 It’s not that content marketers lack ideas. We’ve got a million of them! And it’s not that our ideas are bad. It’s just that we’ve been beaten into believing that we’re not creative because we’ve heard “NO!” for so many years. Our ideas aren’t bad. Our pitches are. And bad pitches kill great ideas. This is how most people pitch a new idea. You: I have a great idea! LEGO publishes a magazine every other month and they’ve had huge success. We need to publish a magazine too! We’re not LEGO, we don’t have a budget for that. That would never work in our industry. Our products are too boring. And on and on with excuses for not testing a new, creative idea. Every idea needs support if it’s to go anywhere. The problem is, we don’t know how to get support for our ideas. You’re probably familiar with the “four Ps” of marketing (price, product, promotion, and place). I’d argue that it’s the art of the fifth P – pitching ­– that leads to brilliantly creative projects. It creates an idea journey. A successful pitch brings people along for the ride. It starts with an inspiration and ends with how the idea can be executed in the real world. It connects the inspiration to your brand. A great pitch paints a picture. It starts with an experience that sparked an idea, and then it connects the dots to the work you’re doing for your brand. It triggers anticipation. An effective pitch shows people what’s possible and gets them excited about the future. Movie trailers do this. Captivating content does this. And if we’re going to be successful pitching new ideas, we have to do it, too. These three elements explain the reactions we want the pitch to stir. But we still need a process for delivering pitches that prompt these responses. Master this process to successfully pitch your big ideas anytime, anywhere. Start with an observation. When you start your pitches by sharing what you’ve observed in the world, you give people context. You help them understand the inspiration for an idea. It’s an experience that they can relate to along with you. Distill the observation’s essence. Next, distill the broader meaning you’ve observed. Bring out the big theme anyone can relate to and understand. Relate it to your brand. Connect the dots between the essence of what you observed and what that means to your own brand. This is how you give people a big “aha!” about how your creative idea can impact the work you do. Explain your idea generation. This is where most people begin. It’s also why they meet so much resistance. When you preface the explanation of how you generated your idea with the observation, distillation, and relation to your brand, you can hone in on why your observation matters ­– and how it has an opportunity to create value for your organization. 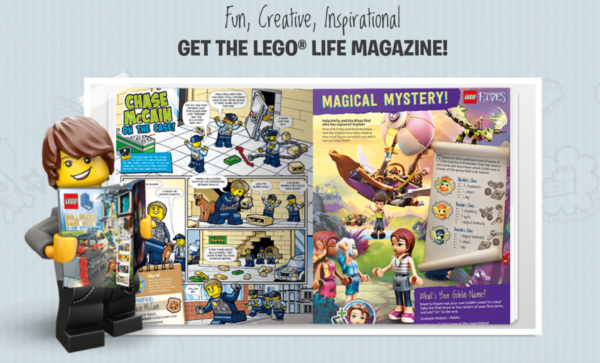 Think about the pitch we started with (“LEGO publishes a magazine…. We need to publish a magazine too!”). Remember how it prompted our boss to give us a million reasons why it wouldn’t work? Here’s how to pitch the same idea using this four-step process. I was reading my daughter’s LEGO magazine the other day, and I noticed how it offers so many different activities for kids who love LEGOs. There are comics, interviews, and even competitions. As I flipped through a couple of issues, I realized that LEGO is great at using the magazine as a way to build community. It gives them a tangible connection to people in a format they can take with them anytime, anywhere. I thought about that in the context of our brand. In the health care field, we have so many people who aren’t on computers during the day. And reading from a smartphone is hard. I see an opportunity to build a community in ways that other brands in our industry are overlooking. That’s how I came up with the idea of a print magazine for health care professionals. One that’s fun, that relieves some of the pressure they feel every day on the job. It would feature interviews with interesting people who have unique specialties. And it would only come every other month, so readers would have time to digest it and look forward to the next issue. That schedule also gives our team time to curate the highest quality content. A thoughtful pace and a focus on quality reinforce what we want the health care community to think about our brand. If you heard each of these pitches, which would you support? When you follow this simple process, you’ll get close to “yes” more often. The more you find support and positive feedback for your ideas, the more confident you’ll feel about pitching again. Success breeds success. Once you get into the habit of pitching this way, you’ll realize that successful pitches don’t depend on divine inspiration, but rather on refining your pitching process over time. Soon enough, you’ll be as excited to pitch creative ideas as you were during your first year on the job. Renew your creativity and your confidence by learning from experts and peers at Content Marketing World 2018. Register now for the best savings!